What seperates us from the avarage shop? Infinisys continually investing in upgrading machinery and software in order to provide their clients with the best product and value possible. It's not about being fast. It's about being fast and accurate. Precision machine manufacturing for every industry. 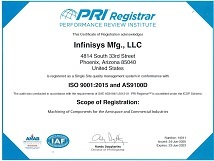 Founded in 2006, Infinisys-Mfg is the fastest growing machine shop located in Phoenix and is at the forefront of manufacturing technology. Producing products for the Aerospace, Medical, Defense, Industrial and Commercial industries with the highest precision and always dependably on time. We are constantly expanding and improving our manufacturing capabilities; continually monitoring new equipment and manufacturing techniques to meet the ever increasing demands of our customers. With our state-of-the-art equipment we offer the most flexiblity and reliablility of any machine manufacturing company today. Our engineers will work with you every step of the way to get your product made to every single specification you need. Our motto here is Quality over Quantity and we stand by it. Every item manufactured is inspected by our top of the line quality control department. Every product is inspected multiple times and nothing gets sent out unless it meets every specification. When you order parts from Infinisys-Mfg, you can rest assured that you will receive exactly what you ordered. Infinisys-Mfg has decades of experience using materials like Aluminum, Brass, Bronze, Copper, Cobalt, Inco, Iron, Monel, Magnesium, Nickle, Stainless and Titanium. With everything from manual machines to fully automated mills and lathes, we are completely dedicated to providing machined tool solutions to meet your specific requirements. Whether your project requires small quantities for proof of concept or larger production runs, Infinisys-Mfg can do the job.